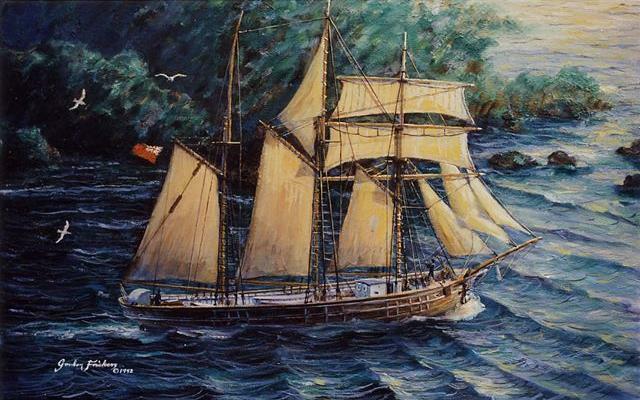 As the “Jane Banks“ schooner sailed from Fowey, no one knew she would be making the last commercial deep sea voyage by an engineless British merchantman, and she barely survived as she developed a severe leak while returning through the notorious Bay of Biscay. From Fowey, Cornwall towards Bermuda, “Jane Banks” of Fowey, a Stephens ship. When old Mr Stephens died, so did his fleet, “Jane Banks” being laid up at Par Dock and later on Par Sand alongside “Waterwitch“. Jane Banks had a long history which you can discover via the further reading link below. A typical european working schooner, Jane Banks started life as the ‘ Frau Minna Peterson‘ built in Germany.